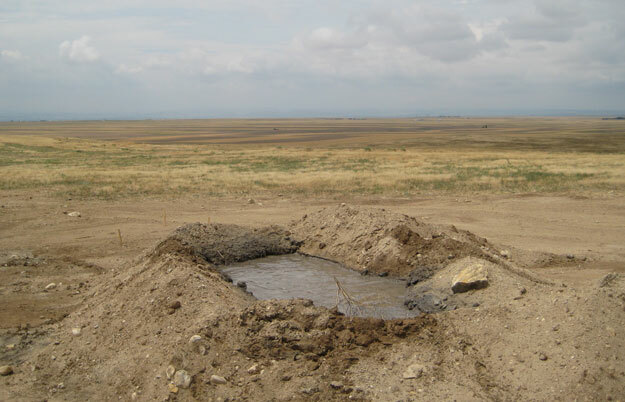 Powertech mud pit containing contaminated water and drill cuttings. The unfenced pit is open to wildlife and domestic animals. 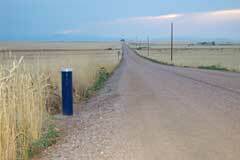 Antelope Hill, Weld County, Colorado - August 2007. The Future for Northern Colorado? 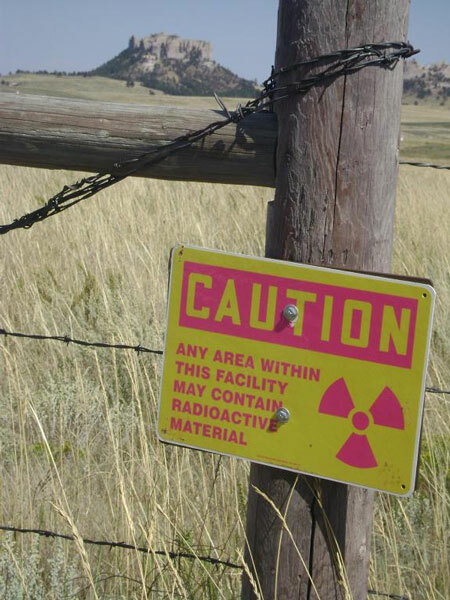 Radiation warning sign outside of Crow Butte in-situ leach uranium mining facility, located near Crawford, Nebraska. Crow Butte is owned by Cameco Corp., a Canadian company. Photo courtesy of the Lakota Media Project of Owe Aku. 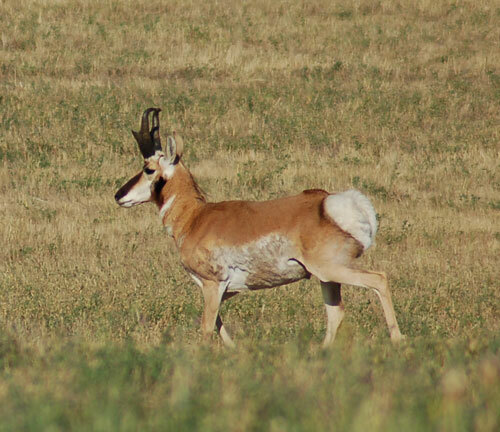 Pronghorn antelope two miles east of potential open pit uranium mine, Weld County, Colorado. Photo: J. Woodward - June, 2007. 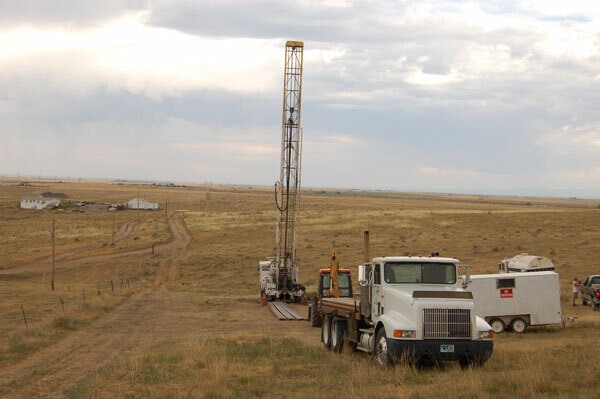 Powertech contractor drilling exploration borehole east of Weld County Road 17 and north of Weld County Road 106. The Colorado Division of Reclamation, Mining, and Safety approved Powertech's new exploration drilling program on August 27. 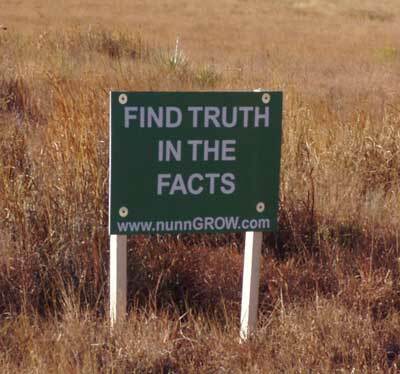 Note the friendly signage, including the small green sign with the fictitious domain name and advice to "find truth in the facts". 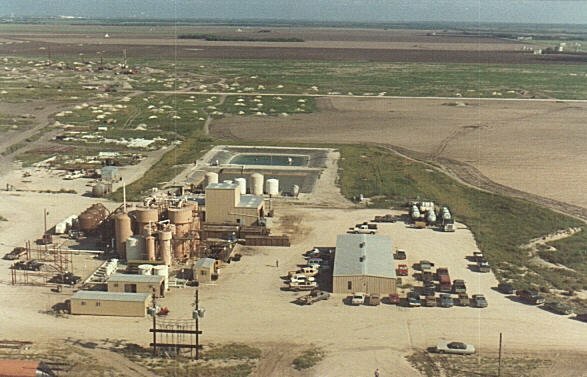 Does that include facts such as aquifer restoration data from the Texas Commission on Environmental Quality showing 17 in-situ leach uranium mines that were unable to clean up elevated levels of uranium in the ground water? Photo taken August 27, 2008 courtesy of H. Mike Williams. 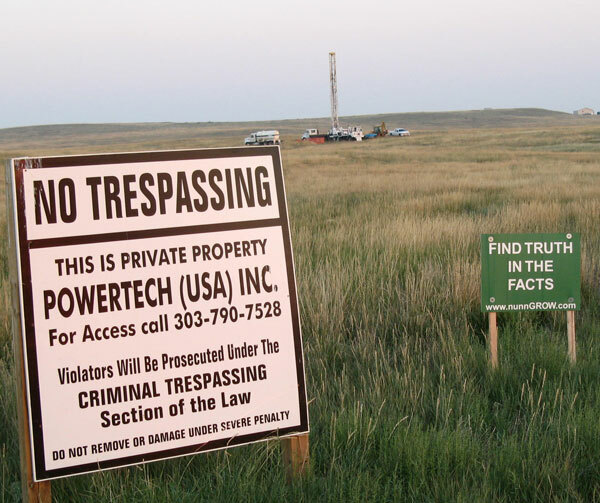 Powertech drilling rig at northwest corner of Weld County Roads 19 and 106. 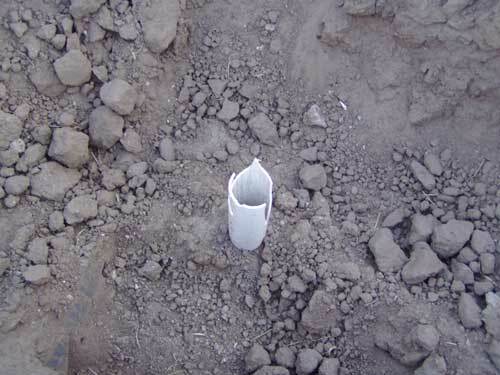 The drilling contractor is Davis Drilling from Gillette, Wyoming. 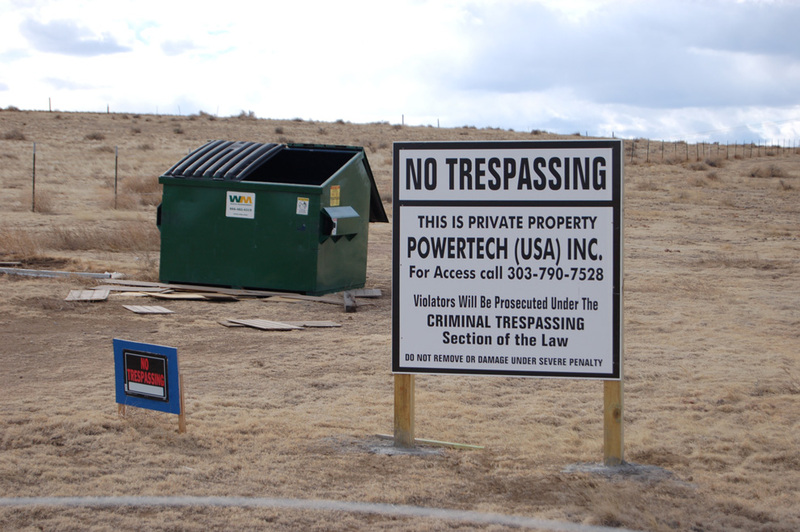 Powertech wellhead on Weld County Rd. 96 just west of County Rd. 23. Note the lack of any barrier protecting the well from vehicle traffic. 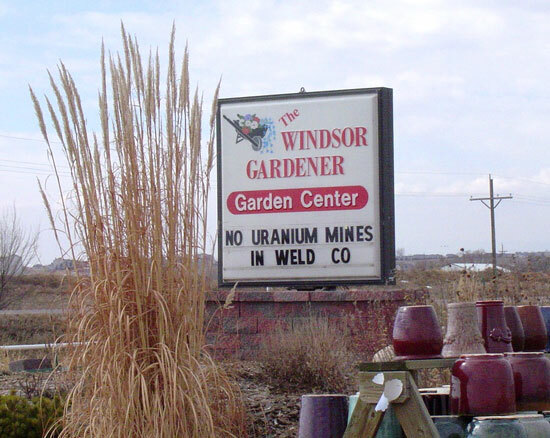 Another local business opposes uranium mining in northern Colorado. 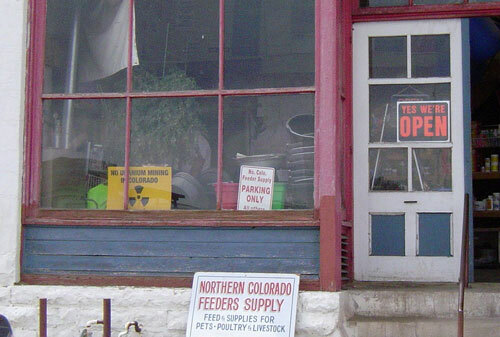 Northern Colorado Feeders Supply, located in Fort Collins, is only eleven miles southwest of a potential open pit uranium mine. 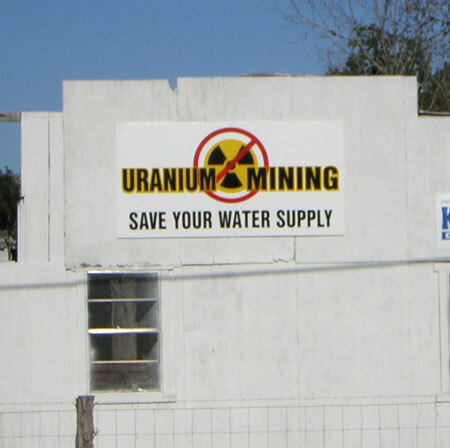 Sign near the Goliad ISL site - Weesatche, Texas. 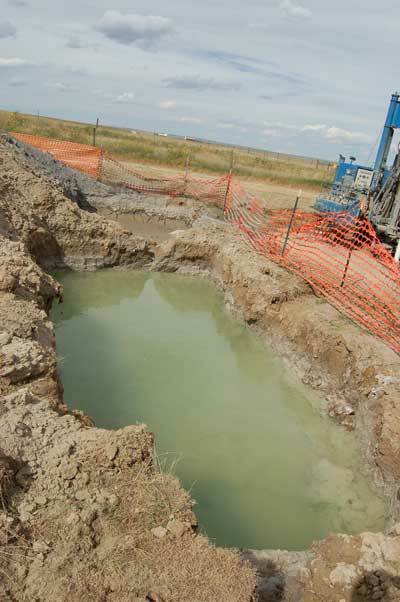 Uranium Energy Corp, a junior mining company with administrative offices in Canada, is attempting to permit the Goliad Project and faces stiff local opposition. 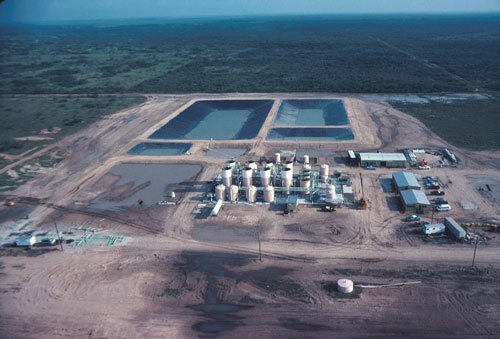 Kingsville Dome ISL uranium mine and processing plant - Kleberg County, Texas - Uranium Resources, Inc.
In-situ leach wellfield under construction by Power Resources, Inc., presumably in Wyoming. Wells appear to be spaced roughly 30-50 feet apart. 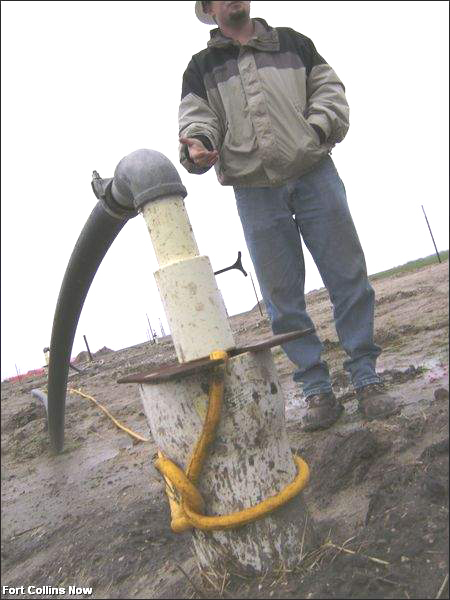 It is unknown if the hydrogeologic conditions in the Centennial/Indian Springs project area would require such close spacing of wells. 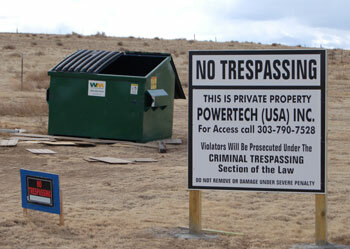 Powertech's attempt to win the hearts and minds of Weld County landowners.